Enriched with herbal ingredients. Helps give beautiful tresses. Helps prevent hair fall. No sticky and no greasy. Paraben free. INLIFE Herbal Hair Oil is a purely herbal formula that brings together the best ingredients of the nature to help give you long, dark, and beautiful tresses. The herbal ingredients are mixed in the apt proportion, to help stop hair fall, premature graying as well as dandruff. The all new INLIFE Herbal Hair Oil also helps to restore the much needed nutrition required by your hair to grow healthily and stand the dust and pollution in the environment without being dull and rough. It promotes the growth of natural hair and the non-sticky formula can be used on a daily basis even when you are going out. 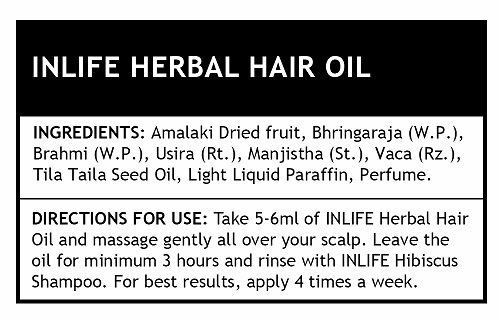 Usage: Take 5-6 ml of INLIFE herbal Oil and massage gently all over your scalp.leave the oil for minimum 3 hours and rinse with INLIFE hibiscus shampoo.For best results apply 4 times a week. Store in cool and dry place. Natural product. No harmful chemicals. Ayurvedic Product. It has light texture and makes hair soft and manageable . I have been struggling with itchy scalp probably because of dandruff. One of my friend suggested me to use .i was applying weekly twice and observed changes too. My best friend started using this hair oil to solve her hair fall problem and after a year almost she noticed a good change, she suggested me to use it. its been 4 months now I am using this oil in the beginning I had some hair fall but now its reduced a bit after a long continuous usage. thanks INLIFE…. Amazing results I got from this product, I lost some hair in front of my scalp and it has regrown after using this Herbal oil. Inlife team, does using this oil result in regrowth. can you confirm please. would live to use if so. It is not very difficult to get rid of when I wash my hair. It gets absorbed into the scalp and easily coats the hair while I massage this oil on my hair. Herbal hair oils are good for hair. This is what I feel and got this INLIFE herbal hair oil which is based on the Ayurvedic formula with variety of Ayurvedic herbs that are beneficial for the hair. It claims that this INLIFE herbal hair oil controls the hair fall and enhances the hair growth. I had some hair fall few months ago and when I got this, I had one thing in my mind that it should strengthen my hair roots and give some relief in the hair fall. As I knew once my hair fall would be under control then the growth would be there as my hair grows fast. I use this oil at night and massaged it. It is advisable that you shake the bottle before using the oil. I massage my scalp and roots with this oil gently with mild pressure from my finger pads. I have used it for 3 weeks and it has given some relief in the hair fall which I find good as the oil is not very expensive. Other than that as this oil is enriched with a lot of herbs which are beneficial so, my hair texture has improved. I mean my hair ends became rough after I colored my hair 2 month ago so after using this INLIFE herbal hair oil I have noticed that the hair are much softer and smoother. It Prevents premature graying, falling of hair, sleeplessness and headaches too. INLIFE herbal hair all is highly recommended as it lives up to all of its claims from nourishing hair follicles to controlling dandruff and hair fall and reducing stress. Any hair problem to any hair type its suites everyone at such an affordable price. Ihighly recommend it to everyone who is suffering from hair fall issues and is looking for natural hair oil. Product was very good. packaging was also good. Fast delivery very good and thanks Inlife!!! I liked it, Hair Fall Controlled upto some extend, Worth to but at this price.. One must try. Light non sticky herbal oil it helped me in relieving dandruff . After my second’s child birth I was losing lots of my hair. My Pharmacist recommend me inlife herbal Hair oil. I started to notice positive results after two weeks of using. Easily available online and inexpensive natural and herbal supplement. Gives a cooling effect to the scalp and nourishes the hair growth. I have no hesitation to recommend this product to any one. I could see the results as early as 1 week. I now can style my hair the way I want with. It helped me in effective memory aid . I was using the oil for strengthening the hair roots and it helps to promotes hair growth. i was advised by others and was using it on regular basis for hair growth.It worked nice product. Makes hair shiny, soft makes hair stronger and teams up with essential hair oils easy to apply. If one likes to use herbal oils or is suffering from dandruff or split ends, I surely recommend trying this..
my hair fall has stopped and my hair has become thick and lustorus.i would recommend the use of this oil to people who are interested in this. I liked Gud Packaging and Quality of Oil is also gud.it, Hair Fall Controlled upto some extend, Worth to but at this price.. One must try. sending my review after use of only 15 days….hair fall count little bit dropped…also hairs looking shiny….love this product. Herbal hair oil is a special herbal medicine. I used it on regular basis it helped me to open the dead pores. It is a nice oil and has a good fragrance too. it is a wonderful oil, it reduces my hair fall and it helps me to regrowth my hair. i have suggested this oil to my friends also. I’m taking them for hair fall says nice PRODUCT.